K Carberry: I am in love with this new collection from Lenox! Palatial Garden by Marchesa for Lenox. They have the entire collection posted on their Facebook page. I want it so badly! they sure look beautiful. Almost as if you can't turn away when you're looking at them, ha? These dishes are beautiful. I went to TJ Maxx tonight after work, and there were four dinner plates that had this same brown/blue palette. I put them in my cart, took them out, put them in my cart, took them out! I wanted them so badly (and this was before I saw your post). But I was good and left without them. But now I may go back! Thanks for visiting my blog and you kind note! Oooh...what a beautiful pattern!!! Love the colors! Thanks for sharing it with us! I love Lenox...haven't seen a dish that they've made...that I didn't love...yet! Well my friend, I must tell you that I just took a peek at your last post...I love, love, LOVE how you are refinishing that table top! It's absolutely gorgeous!!! I copied your photos to my computer for future reference...hope that's okay! I have an old desk in my frenchy studio/office that I would love to do that to the top of! I have black and khaki colored toile drapes in there...oooh, it would look great! Thank you for the grand idea!!! I also wanted to thank you for coming by and taking a peek at my "Springtime" tablescape! I enjoyed your visit and sweet note! Thank you!!! I am adding your delightful blog to my list of blog follows...I'm looking forward to your upcoming posts and seeing that pretty table top finished! It's so very nice to meet you, Kristy!!! oh my, they are so pretty. 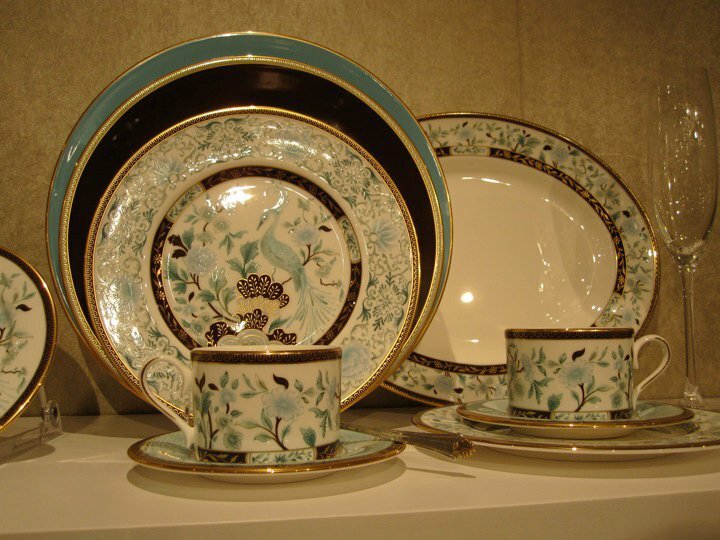 I''ve been drawn to blue lately so those are right up my alley... congrats on your beautiful new dishes..
Sonny, I wish they were mine, but they aren't on sale until fall. Christmas list!! I do love those dishes -- they are such pretty colors!